Sometimes political ads go down in history because they strike a nerve in voters, like Lyndon Johnson's 1964 "Daisy" and Ronald Reagan's 1984 "Morning In America." Others are memorable simply because they feel different. Sometimes they're just plain weird. This year, during one of the most unusual election cycles ever, some candidates across the country are leaning into that nontraditional landscape — especially when it comes to their campaign advertisements. Here's a roundup of some of the most memorable 2016 campaign ads out there — presidential candidates excluded. Jason Kander, Missouri's Democratic secretary of state, is running for U.S. senator in Missouri against Republican incumbent Roy Blunt. Kander, a former Army captain who served in Afghanistan, put out this advertisement in mid-September and his poll numbers rose dramatically, according to The New York Times, making Missouri's Senate race a tight one. The ad depicts Kander discussing gun rights while assembling a rifle blindfolded. "In the Army, I learned how to use and respect my rifle," Kander says in the ad. "In the state Legislature, I supported Second Amendment rights. I also believe in background checks so that terrorists can't get their hands on one of these." Republican Gerald Daugherty is running for re-election as county commissioner in Travis County, Texas. The county is home to Austin, and as Texas Monthly reports, running as a Republican there isn't easy — especially this year, when the presidential race in Texas is closer than it has been in years. Daugherty is probably hoping his choice for a campaign ad will help him stand out, and the ad itself certainly does. In it, Daugherty just can't seem to stop talking shop — jail capacity, the light rail, tax rates — and his wife has had enough. At the end, she looks right at the camera and says "Please re-elect Gerald ... please." Darryl Glenn, a Republican and retired Air Force lieutenant colonel, is running for U.S. senator from Colorado against Democratic incumbent Michael Bennet. Glenn's campaign ad looks more like a commercial for CrossFit than a traditional candidate pitch: He is jumping rope, swinging kettlebells and lifting weights, doing pull-ups and running hills as he frames Bennet as a Washington insider. "I never stop. I can be relentless," Glenn says in the ad. "I love being the underdog." And underdog he is. Recent polls show Bennet ahead by as much as 18 points. Eric Greitens, a veteran from Iraq and Afghanistan and a Navy SEAL, is the Republican candidate for governor in Missouri. He is running against Missouri Attorney General Chris Koster, a Democrat. Recent polls show Koster leading by 5 points. Greitens entered the campaign ad world with a bang — literally. In his first ad, "Taking Aim," paid for by Greitens For Missouri, Greitens holds an assault-style rifle and touts his status as a political outsider. "I'll take dead aim at politics as usual," Greitens says in the ad, before shooting into a field and causing a large fireball to explode into the air. "If you're ready for a conservative outsider, I'm ready to fire away," he says at the end. His second ad, "Big Guns," has pretty much the same theme. It begins by saying Greitens is under attack from the Democrats, who are trying to "steal another Missouri election." The ad goes on to call Greitens a "conservative warrior" who fights back with the "big guns." In the ad, those guns are literal: The rest of the ad depicts Greitens shooting some kind of giant machine gun as a voice over and titles on-screen detail his credentials. At the end, Greitens tells the camera, "Let's take back Missouri." Mark Holbrook, a Republican, is running for U.S. representative of Maine's 1st Congressional District against Democratic incumbent Chellie Pingree. This ad opens on Holbrook dressed in a padded football uniform, with a helmet at his hip. The candidate's name is written across his jersey, with "Congress" below it and the number 16 on the back. "I'm running for Congress, but I'm new to this game," Holbrook says. "The other side will do anything to win." In between shots of Holbrook putting on his padding, the ad also shows him buying doughnuts and talking to a cashier at a gun store. According to the Bangor Daily News, Holbrook's message — which echoes both Donald Trump and conservative Maine Gov. Paul LePage — is unpopular in the state's 1st District and he is unlikely to beat Pingree. Unlike the previous ads, this video, funded by the National Republican Congressional Committee, is an attack ad. It uses a gross-looking Philly cheesesteak as a metaphor for the candidate in question. That would be Steve Santarsiero, who is running for U.S. representative of Pennsylvania's 8th District, which serves Bucks County just north of Philadelphia. Santarsiero, currently a state representative, is running against Republican Brian Fitzpatrick, whose brother currently holds the seat but is retiring. Politico called it "the nation's most competitive congressional race." The video is simply an aerial shot of a "nasty" cheesesteak being made, mostly because it has way too many onions, or as the video puts it: "lots of toppings / no substance." 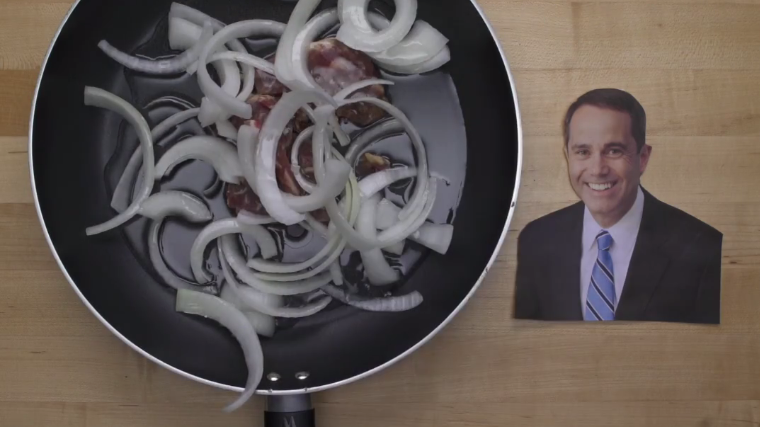 The ad criticizes Santarsiero's record via subtitles as the cook constructs the sandwich on top of a cut-out of the Democrat's face. In the end, the words across the screen say "Ew. Send it back." This video is part of a series of videos called "Nasty Cooking." They're put out by the NRCC and attack various politicians. Some of them — like a greasy cheesesteak being used to illustrate the shortcomings of a politician with an Italian last name — could be interpreted as perpetuating negative stereotypes. This one is different from the others on the list in that it isn't a video — it's a website. 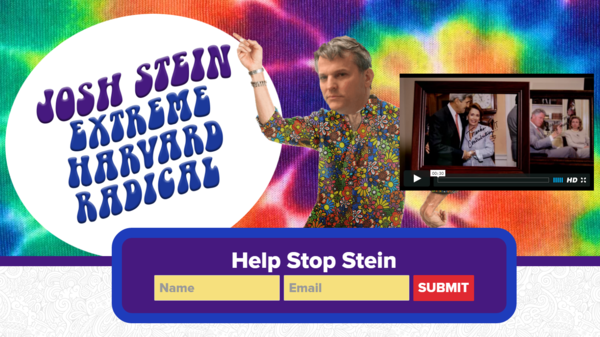 Like the Nasty Cooking video, it's also an attack ad, funded by the political action committee Carolinians for Freedom. The website's URL is extremeharvardradical.com and it's just one page with no tabs, though there are links to outside sources. It's set up to discredit Josh Stein, the Democratic candidate for attorney general in North Carolina and a former state senator. Stein is running against Republican state Sen. Buck Newton. According to the site, Stein wants to "bring his Harvard values to North Carolina" and has "advocated for crazy ideas like banning grocery bags." Megan Verlee of Colorado Public Radio, Steve Mistler of Maine Public Radio, Dave Davies of WHYY in Philadelphia and Tom Bullock of WFAE in Charlotte, N.C., contributed to this story by identifying the included ads.